From 6-8pm the community will perform bhajans (devotional hymns), accompanied with music and dancing. (Participants will have the opportunity also to dance!) At the end of the bhajan service, a light meal (prasad) will be served. August 18, 2017, 3-5 p.m. 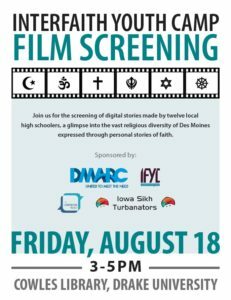 In collaboration with the Des Moines Area Religious Council and the Iowa Sikh Tubanators, we are hosting an interfaith youth camp for high school students from six religious traditions: Jewish, Christian, Muslim, Hindu, Buddhist, and Sikh. At the camp, these students are creating digital stories about personal faith experiences and practices, visiting each other’s places of worship, and discussing the principles of interfaith leadership from Eboo Patel’s Interfaith Leadership. On Friday, from 3-5pm, in Drake University’s Cowles Library Reading Room, we will be screening their digital stories for the general public. Please join us for this special event.